With a very successful 2017 behind us, we’re set to put shovels to dirt to kick off 2018. Looking to give back to the trails you enjoy? Curious about what helps a trail stand up to weather and high use? Want to become more connected to a great community? Join us to learn about caring for our trails and the environment! The Trail Academy was initially developed in order to share our knowledge and experience about sustainable trail work and provide our members opportunities to develop skills to help us look after our trails. 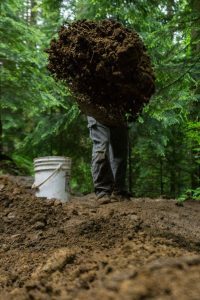 We presently offer three courses that teach best practices of trail maintenance: Foundations of Trail Care, Rock Work, and Wood Structures. Read the course descriptions here. Thank you to Arc’teryx and Race Face for their generous support of the Trail Academy and Shore Corps programs and their continued commitment to our local trail network.